REFINED SUSPENSIONS: The new Panigale V4 is equipped with a 43 mm diameter Showa Big Piston Fork (BPF) that is fully adjustable in the compression and extension of the hydraulic brake and in the spring preload. The fork sleeve seats chromed legs to which Brembo radial brake callipers are attached. The front package is completed by the Sachs steering damper. On the back there is a fully adjustable Sachs shock absorber that on one side is attached to the Desmosedici Stradale with forged aluminium. The new Panigale V4 S and Panigale V4 Speciale are equipped with an Öhlins NIX-30 fork, Öhlins TTX36 rear shock absorber and Öhlins steering damper with event-based control system. On these versions, the suspension and the steering damper are controlled by the second-generation control system, Öhlins Smart EC 2.0, featuring, among other things, the new Objective Based Tuning Interface (OBTi). 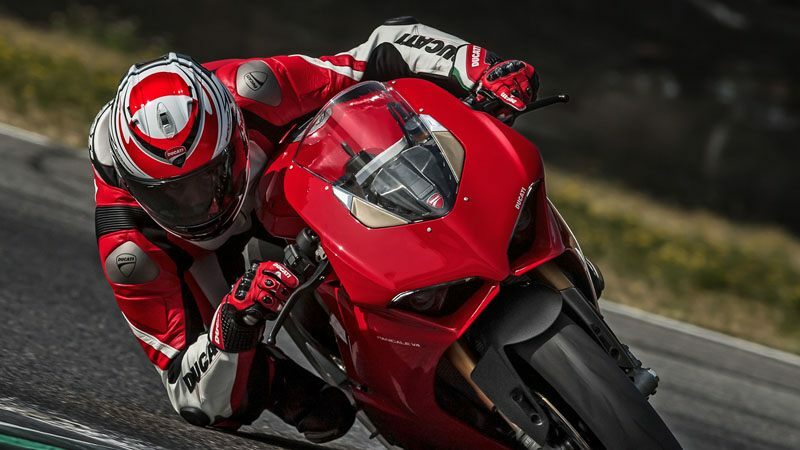 RIMS AND TIRES: While the new Panigale V4 mounts 3-spoke cast aluminium rims, the new Panigale V4 S and Panigale Speciale are equipped with 3-spoke aluminium alloy rims. 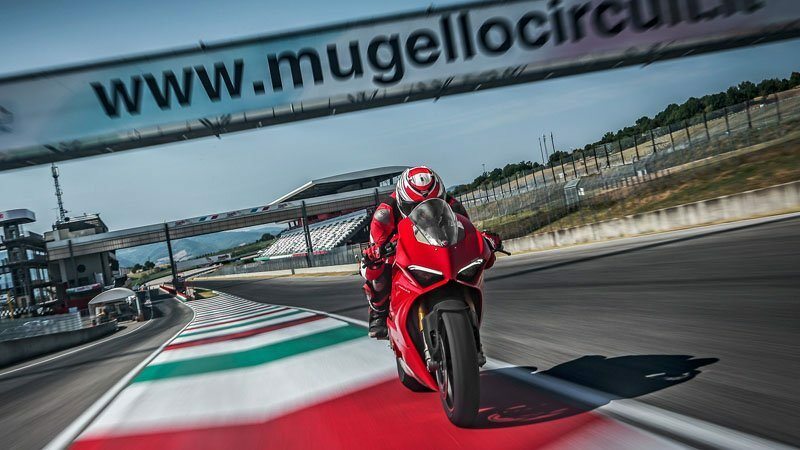 Ducati and Pirelli worked closely together in the development of the new Panigale V4, the first motorcycle to use the new Pirelli DIABLO™ Supercorsa SP as original equipment, 120/70 ZR17 on the front and the revolutionary 200/60 ZR 17 on the back. The latest version of the DIABLO™ Supercorsa SP in the new 200/60 ZR 17 size, already widely used as slicks in the FIM Superbike World Championship, is in fact a generational leap in the field of racing tyre replicas. The innovative profile of the new rear size maximises the footprint during the deepest corners and makes the most of the benefits of the dual mixture technology used, which on the shoulder uses the same SC2 compound as in racing slicks that can offer the grip typical of a racing tyre while still guaranteeing the robustness and versatility needed for road use. To work in full harmony with the rear tyre, even the front tyre has benefited from a major new development: all the characteristics like manoeuvrability, feedback to the rider, grip solidity, feeling of safety and predictability of grip loss have been optimised by creating a new front profile, with a slightly larger width than the previous version of the product. 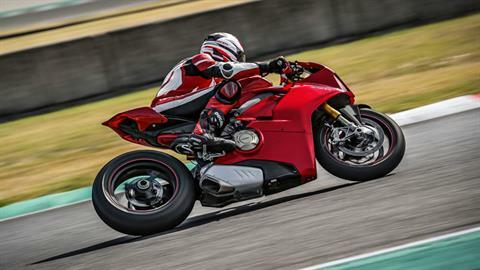 The redesigning of the shapes of the semi-finished products and the belting scheme has made it possible to set new benchmarks in terms of agility and manageability linked to racing peak performance. Finally, the new tread design of the DIABLO™ Supercorsa SP features a new "flash" geometry to optimise track performance by improving wear, and reduced groove widths designed to provide adequate support for the increased lateral thrusts. BRAKING SYSTEM: The Panigale V4 range exclusively incorporates the brand new Brembo Stylema® monobloc callipers that represent the evolution of the already high performance M50 callipers. The new Stylema® callipers, machined from a single alloy block, have some lightened areas on the body and the fastening bushings that, compared to the M50, make them visibly more compact and allow a weight reduction of 70 g per calliper without loss of rigidity. Other evolutionary improvements have been made on the internal ventilation for greater consistency of performance. The new Stylema® callipers offer increased hydraulic performance thanks to their extreme rigidity, guaranteeing the system's quick response, reduced brake lever stroke and maximum flexibility. 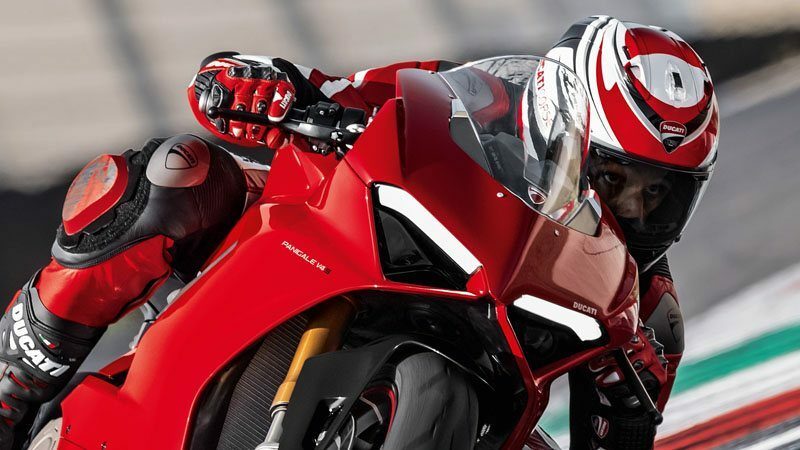 The Brembo double callipers each have four 30 mm diameter pistons working on 330 mm diameter discs, providing outstanding braking power, while at the rear there is a 245 mm single disc with 2-piston callipers. The braking system is supported by the ABS Cornering EVO system, which uses the lightweight 9.1MP Bosch control unit. 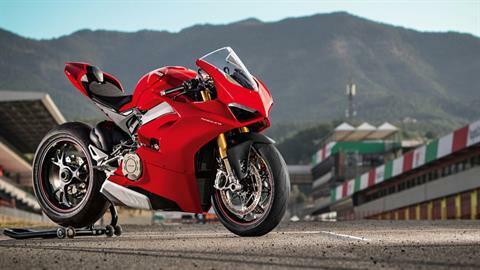 RACING TANK: The proximity of the new Panigale V4 to the racing world is underlined by the lightweight 16 litre aluminium tank that, as is the case with racing bikes, has a portion of the capacity situated under the rider's seat. The space not occupied by fuel - in the front of the tank and under a cover - has been used to place all the electronics, including the battery, which in the Panigale V4 S and Panigale V4 Speciale versions are lithium-ion. INNOVATIVE "FRONT FRAME": The new "Front Frame", left visible for all to see, becomes an integral part of the motorcycle giving it a tight fairing, practically custom tailored. IBOSCH EVO ABS CORNERING: The Bosch ABS system, equipped with ""Cornering"" functionality that engages the ABS even when the bike is leaning into a curve, has evolved extensively with the introduction of new intervention logic and control types. Bosch EVO ABS Cornering can be set to three different levels to fully meet track and road driving needs, even in the most critical low-grip situations. While level 3 is indicated for the road or for low-grip conditions, thereby ensuring safer and more stable braking, levels 2 and 1, which give priority to braking power, are more appropriate for racing on high-grip surfaces and racetracks. 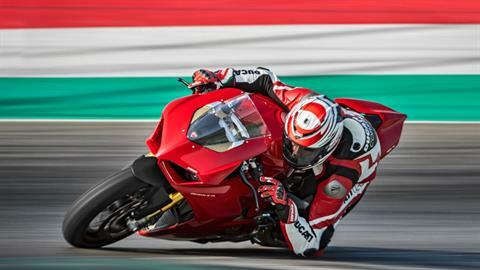 Level 2 selection makes it possible to safely slide into curves for better performance in sports riding. Level 1 of the ABS, recommended for use on the track, engages ABS only on the front brake, but maintains the ""Cornering"" feature that allows braking deep in the corners and to recover from any riding errors. 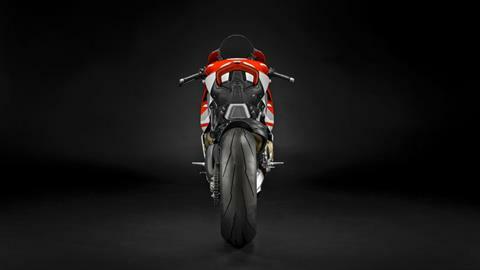 DUCATI TRACTION CONTROL EVO (DTC EVO): The DTC EVO on the new Panigale V4 is based on an algorithm that makes its interventions more precise and quick. DESMODROMIC SYSTEM: On the Desmosedici Stradale the design of the desmodromic system is a key factor for obtaining top performance. 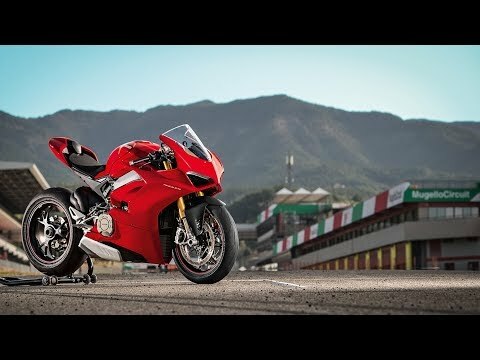 Riding Modes, Power Modes, Bosch Cornering ABS EVO, Ducati Traction Control (DTC) EVO, Ducati Wheelie Control (DWC) EVO, Ducati Slide Control (DSC), Engine Brake Control (EBC) EVO, Auto tyre calibration. 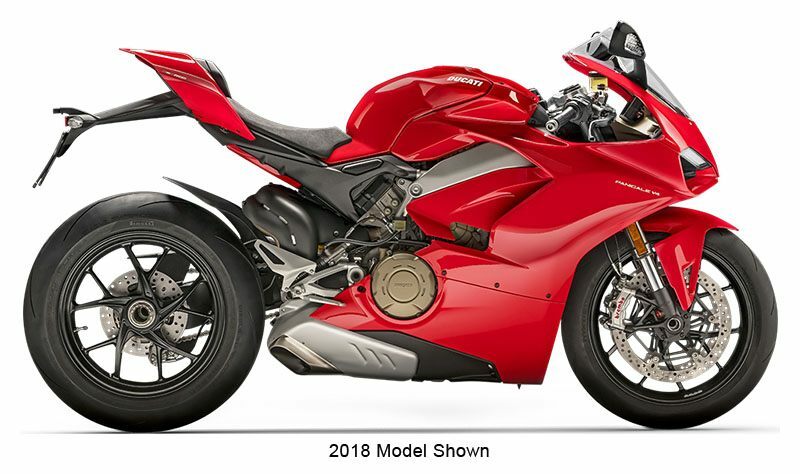 Ducati Power Launch (DPL), Ducati Quick Shift (DQS) up/down EVO, Full LED lighting with Daytime Running Light (DRL), Sachs steering damper, Quick adjustment buttons, Auto-off indicators. Rear - 5-spokes light alloy 6 x 17 in.